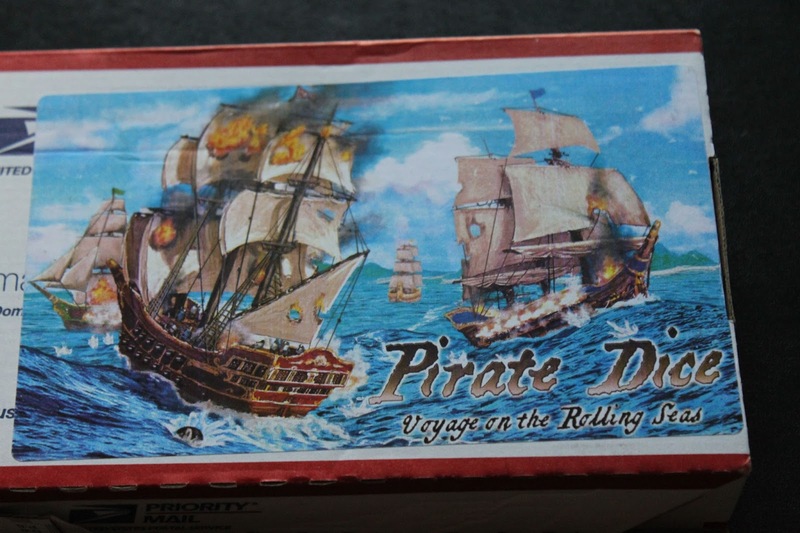 Pirate Dice is an up and coming dice and board game from Gryphon Games that is currently in the middle of its Kickstarter Campaign in which you are the captain of a pirate ship racing against other pirates on the high seas to capture the treasure and get back to your port of call before they blast you out of the water and claim the treasure for themselves. In the prototype I was sent there is four sets of command dice (each in its own color), matching ship dice, a treasure dice, four gridded map board pieces and four player boards to plot out your actions in advance. To play the game, Pirate captains roll their command dice and then choose (up to) four commands to execute in a row. 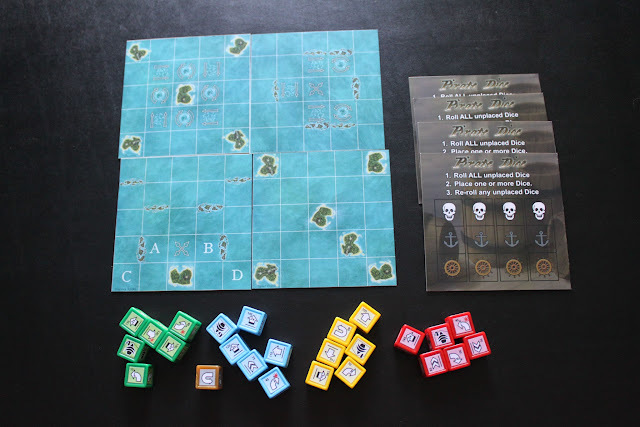 These commands may involve moving forward multiple spaces, turning to port or starboard (thats left and right to us not currently at sea), firing cannons and so on planning out four actions at a time in a row. 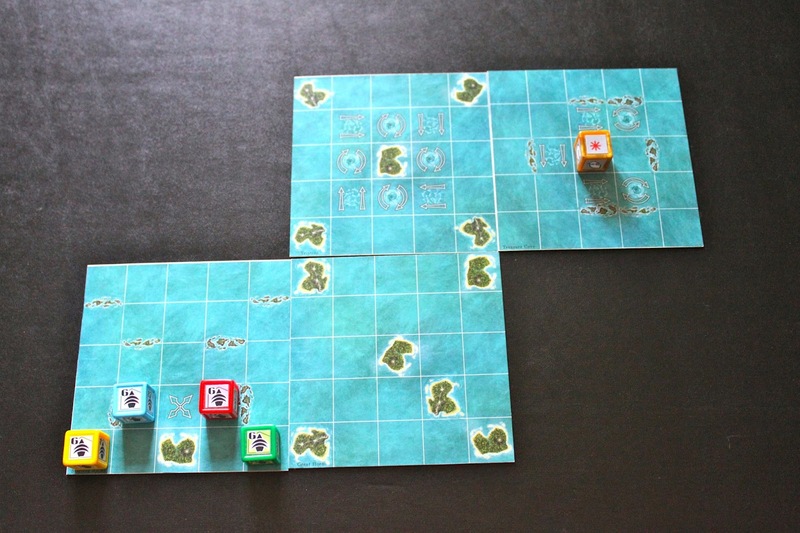 While you are doing this, so are the other Pirate captains, all of which have their eyes on the prize - the elusive treasure dice which is four tiles away. Once everyone has locked in their actions, they are revealed for all to see. From here, each players first action is executed based on who has the highest priority (represented as a number in the corner of each face of the dice), followed by second highest priority and so on. Once the first command of all captains has been executed, they move on to the second in the same fashion. 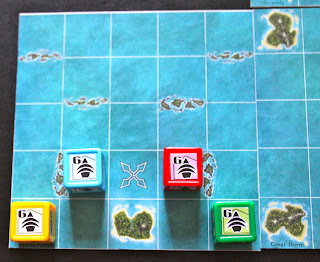 Because all captains plan out their actions before seeing anyone else, there is a really real chance (and high likelihood) that captains will crash into each other, pushing them into different squares, changing the final outcome of their previous planning of their moves and their final destination, damaging their ships in the process. If their ships take on too much damage, they will be forced to "lock" in previous commands forcing them to repeat them time and again until they make the time to repair their ships. Once a captain has navigated the waters to the treasure dice, they are half way there. 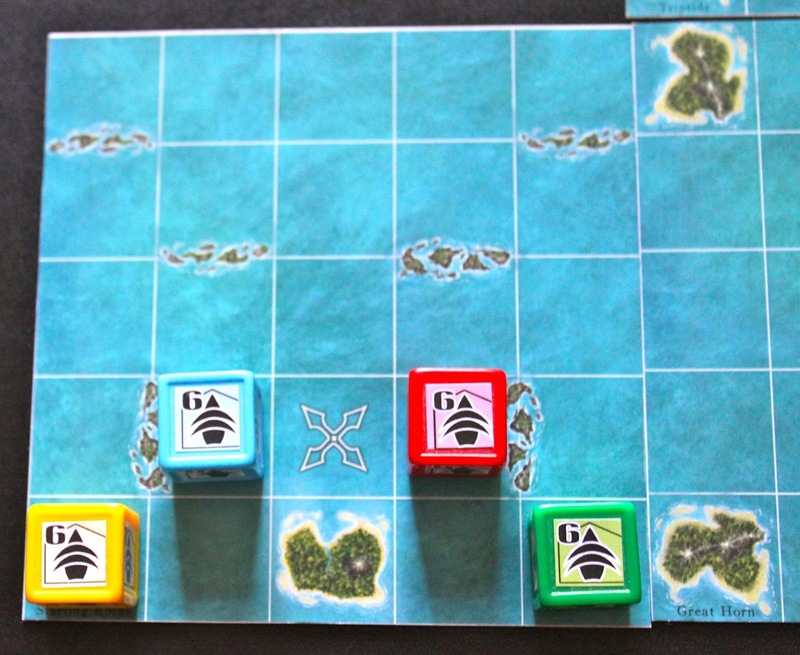 The treasure dice now acts as an extra command die for them as they race back across the waters and their rival captains to their home port. If they can make it back there with the treasure, then they will win the game. However if a rival captain can sink them by ramming them or shooting their cannons at them, they can swoop in and claim the treasure as their own! You may find that the mechanics of Pirate Dice sound vaguely familiar, especially if you have ever played Robo Rally. 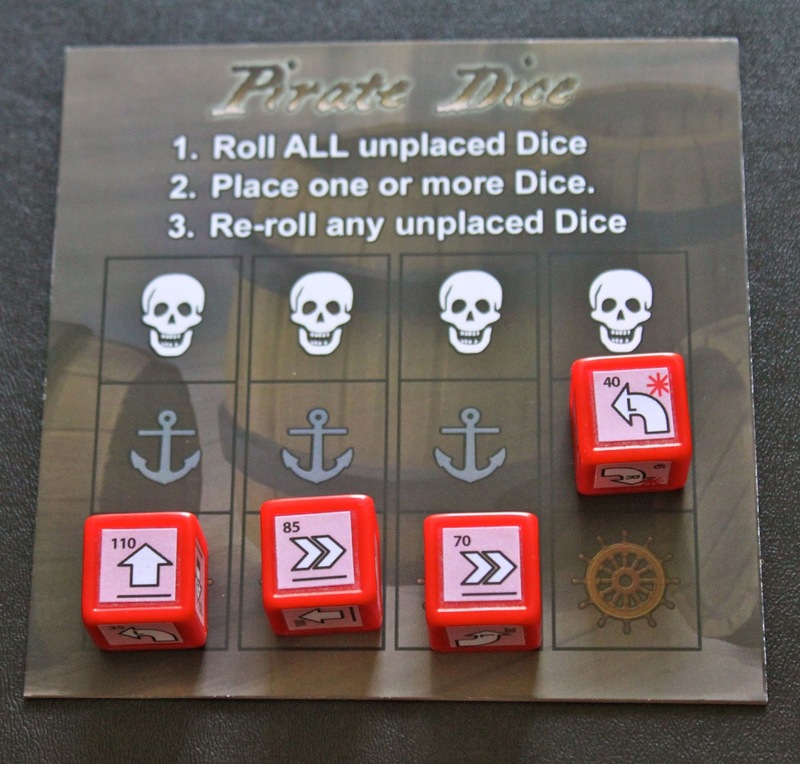 This is very fair since Pirate Dice is loosely and indirectly based on it. The designer Clint Herron created Robo Derby Express, a print & play dice game that was inspired by it for a game design competition. The result is a fast moving, highly interactive game that is fun and easy to play. 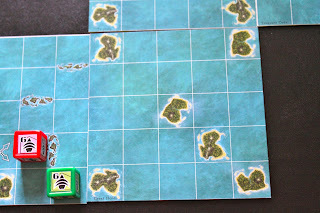 My wife and I first had a chance to play it on a plane on our way to a wedding and its compact size made it very easy to set up and play on the tray tables. Sure other people on the plane could hear us rolling dice constantly and I'm sure it was distracting, but no less than the screaming baby three seats behind us (you know who you are baby). 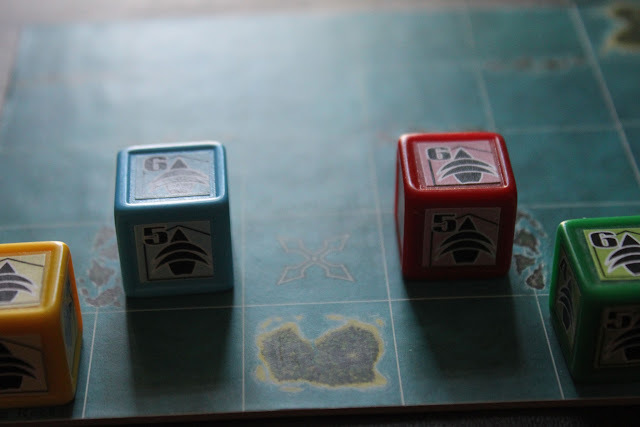 Our second game was three players, with all captains arriving at the treasure dice at the exact same time, causing the space to become very congested. Our actions caused us to run into each other at almost every command resulting in me sinking twice. While this was unfortunate for me, it made for exciting gameplay leaving me to wonder how it'd handle with four. 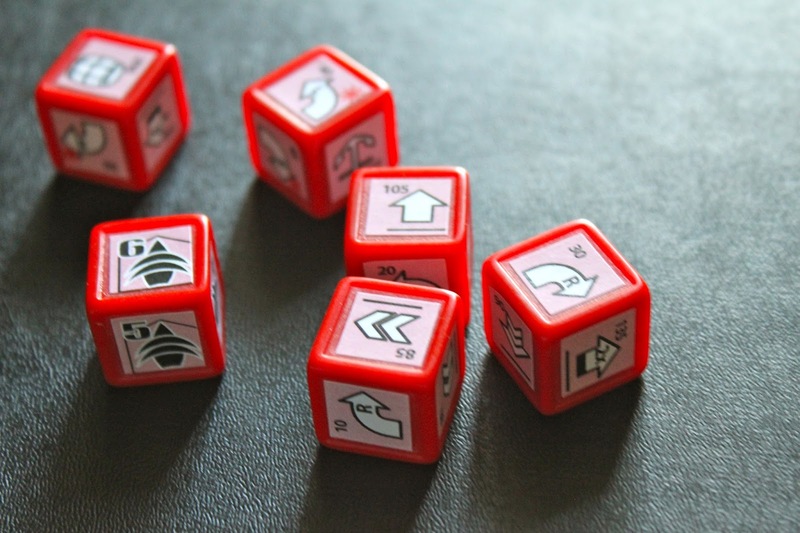 There is a slight learning curve as you have to learn what the different symbols on the dice mean, but after about two rounds of play the symbols become second nature to you, allowing you to quickly plot out your actions and roll out. The use of dice instead of cards like Robo Rally uses is interesting since every roll has the same odds of what actions will come up (where as with the cards in Robo Rally there is a finite amount of them that you could technically count to know what actions are still available to you) which makes for some fairly chaotic gameplay. While some may not like the uber-randomness that comes from it, I feel it adds quite a bit to the game since you never know what you're going to get when you cross a pirate. Not to mention its a dice game, you should have expected that when you picked it up. 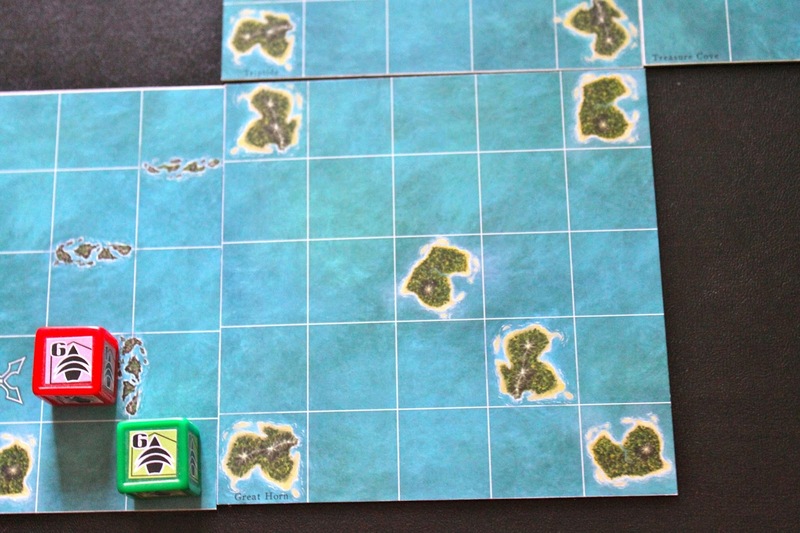 As mentioned, the prototype I was sent to play only came with four map boards (one start board, one treasure board, and two others) which is the exact amount of tiles that are required to play when setting up the board. The final copy of the game will come with more, and if you were to back it via Kickstarter you can gain additional exclusive map tiles to play with. Also, there is currently a contest running that will result in a fan-made map made available. You can create your map at piratedice.com. Personally I think this component is fantastic as it will result in an infinite amount of map options for folks to use, and the map creator interface is incredibly straight forward and easy to use! In the end, I found that I liked its speed and gameplay quite a bit, and the dice really allow for quick decisions that can end in either epic or disastrous results, and am very interested in how this campaign plays out.